CALGARY, AB – Wild Rose Brewery has announced details of a new seasonal beer that will be bringing a bit of the tropics to Alberta this summer. Our brewers developed this beer during the cold Albertan winter, thinking of warmer days. The Ponderosa pine may be the closest thing Alberta has to a tropical palm tree, but we wouldn’t want it any other way. Ponderosa Gose is an irresistibly refreshing wheat beer brewed with passion fruit, salt and coriander. Pale, tart and unfiltered, this brew is your party pal in tropical Alberta. 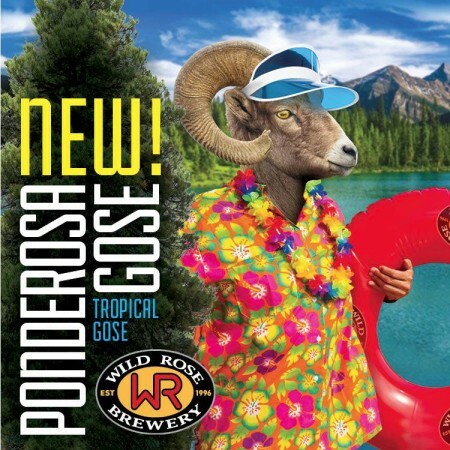 Ponderosa Gose has been available to preview at the Wild Rose taproom in advance of its official release on May 5th, when it will be distributed in 473 ml cans at liquor stores and licensees throughout Alberta. An “Alberta Luau” launch party for the new beer will take place at the brewery on May 13th, featuring live music, DJ, pig roast and more. Tickets are available online for $40.